The timber trade in general is a huge part of the history of Canada as a whole, and the Ottawa area in particular. The trade blossomed in the early 1800’s, with log rafts and booms being a common sight on the Ottawa River for over a hundred years. Related trades played a large part in the development of the city, with a large number of local trades becoming part of the cultural landscape in the sawmills and their later cousins the pulp and paper mills. The timber industry was dominated by backbreaking labour, what would now be called blue-collar work, and in a similar vein, the famous French-Canadian dish of poutine is considered a very blue-collar dish (although honestly everyone eats it, no matter their level of wealth). 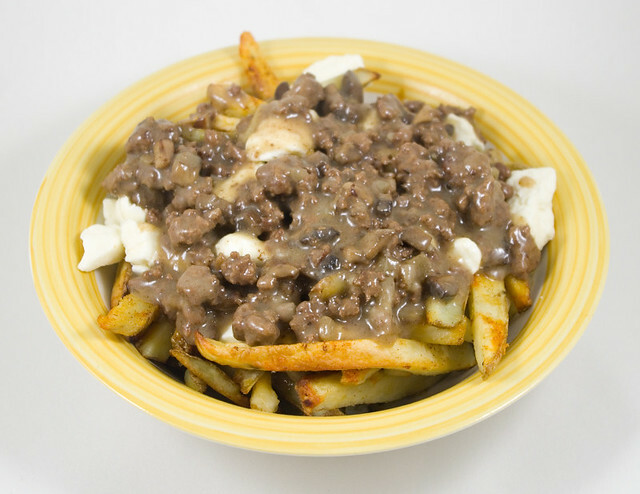 Poutine would probably have been appreciated by log drivers, but it didn’t come into being until the 1950’s, when the local trade was on its last legs. Poutine is a mouth-wateringly delicious pub grub combination of french fries, cheese curds, and gravy. The one that I made yesterday, pictured above, also had chunks of the ground beef that I used to make the gravy from scratch. I made the fries using the Baked French Fries I recipe on Allrecipies — although I set the oven to 400°F (205°C) instead of the higher temperature in the directions, as per suggestions in the comments. Poutine may look like a hot mess, but it tastes fantastic, and it’s particularly good while/after a few drinks. Of course, you have to follow a meal of meat and carbs with dessert, right? My family ate these strawberry cupcakes with buttercream frosting following the poutine (I don’t know how they had any room left). The cupcakes were Sprinkles’ Strawberry Cupcakes from Martha Stewart. They came out looking great, but I was a little disappointed in the flavour; I’d hoped they would taste more like the strawberry puree that was in the batter, but mostly what I could taste was vanilla. Originally I had planned to make a maple buttercream frosting, but I don’t know what I did wrong and the frosting separated as soon as I stopped mixing. I was so disappointed! I ended up using store-bought Duncan Hines buttercream frosting (which contains neither butter nor cream), which was a blow to my pride, but at least my friends with milk allergies could eat it. 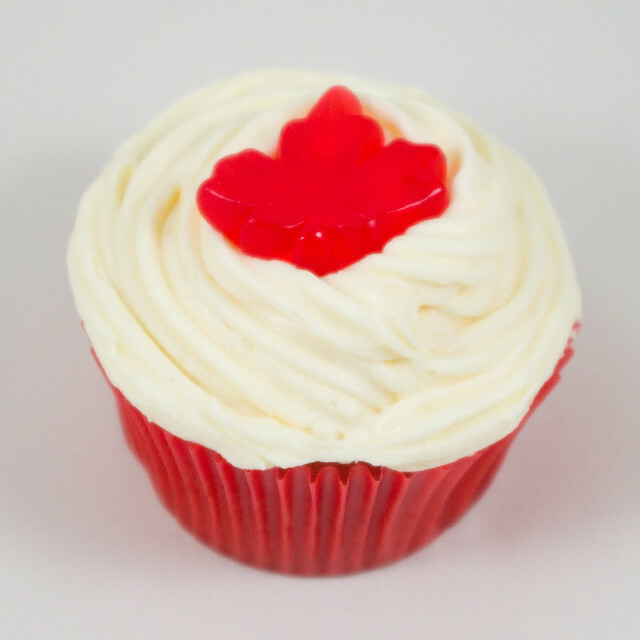 And hey, the cupcakes looked red and white for Canada Day! One of my daughters was having a friend over for dinner tonight, so I made up my mom’s famous homemade macaroni and cheese. 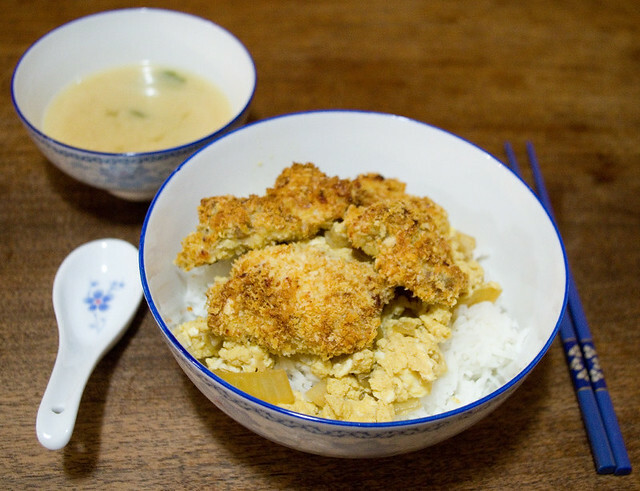 This dish is pretty much a guaranteed crowd-pleaser with the under-10 set, who are often more difficult to please and are less willing to try something new. It’s exponentially better than instant pasta and powdered cheese. In my opinion, my mother makes the best macaroni and cheese in the world; it was such a favorite of mine that I requested it for my birthday dinner for at least twenty years in a row. 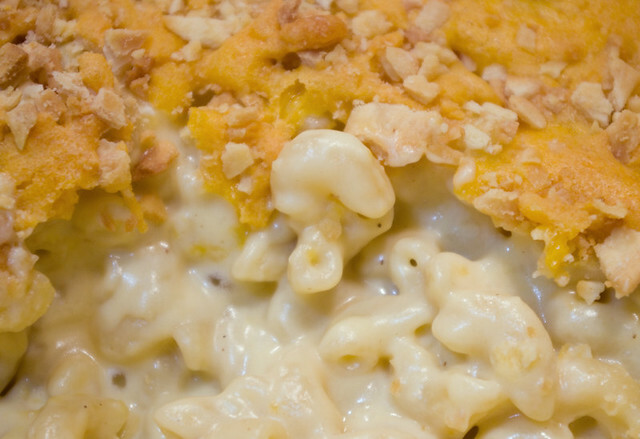 It made me very sad when I realized that my dairy intolerance means that I’d have to give up eating mom’s mac & cheese. Mom’s recipe originally came from the back of a box of dried macaroni noodles, but over the years she tweaked and perfected it until it bears little resemblance to the original. 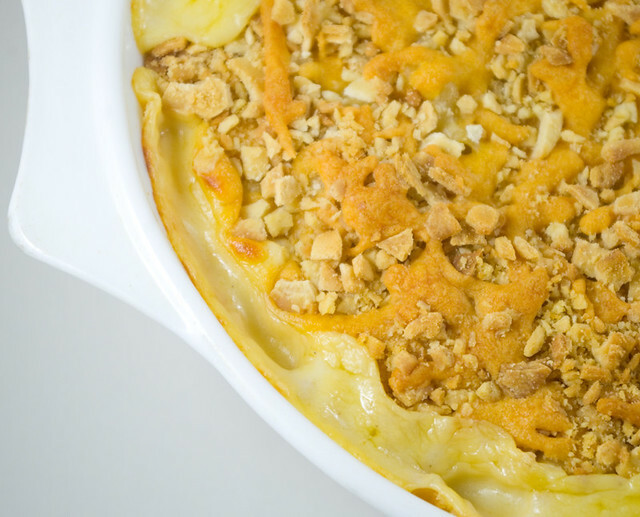 This recipe makes a lovely creamy cheese sauce for the pasta and creates a crispy crunch on the top of the casserole. The crispy top is generally everyone’s favorite part and is fought over in my house. Cook over medium heat, stirring regularly (with a whisk works best) until thickened to the consistency of a white sauce. 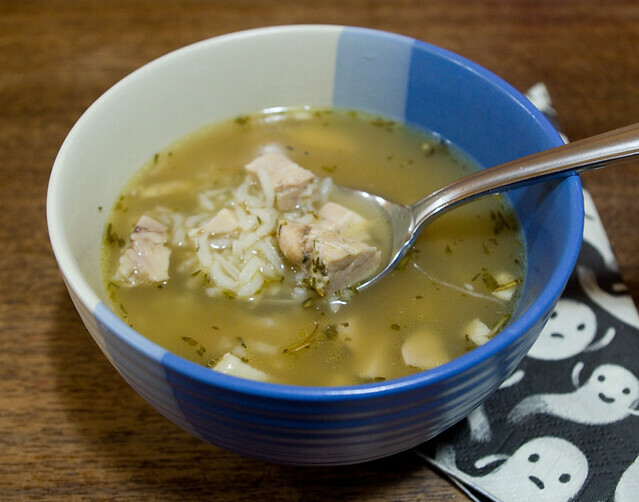 Alternately, cook in the microwave, stirring every 3 minutes to remove lumps, until the desired consistency is achieved. 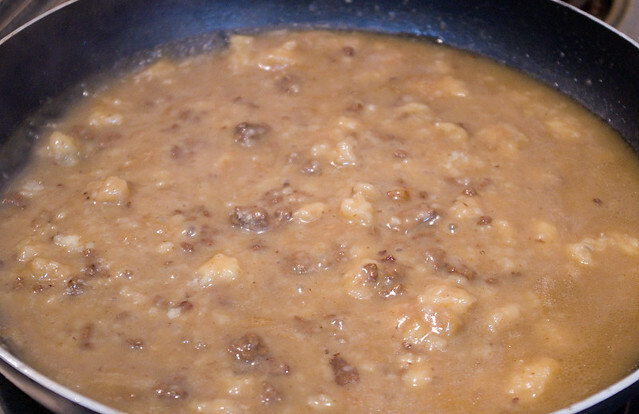 Stir mixture until cheese is fully melted and ingredients are evenly mixed. Add the previously-cooked macaroni and stir well. Fill a 2.5-quart (2.3L) oven-safe casserole dish with this mixture. If sauce was prepared in the microwave, simply add the noodles to the mixture already in the casserole dish. Sprinkle this mixture evenly on top of the contents of the casserole dish. *I prefer Premium Plus or Premium Plus Whole Wheat crackers, but there’s no reason that other kinds of crackers can’t be used. I have made this recipe so many times — and relied on whatever I had in my pantry at the time — that I have probably used everything going. The crushed crackers used in the photos were actually Original Baked Naan Crisps by Sarah’s Fine Foods. – This dish freezes very well. When preparing portions for the freezer, skip the baking step when preparing. Instead re-heat the entire casserole in the oven at 350°F (175°C), which will re-melt the cheese and crisp up the topping. Bake until cheese starts to bubble and the center of the casserole is warm, which generally takes between 30min and 1 hour, depending on how large the portions are that you have frozen. 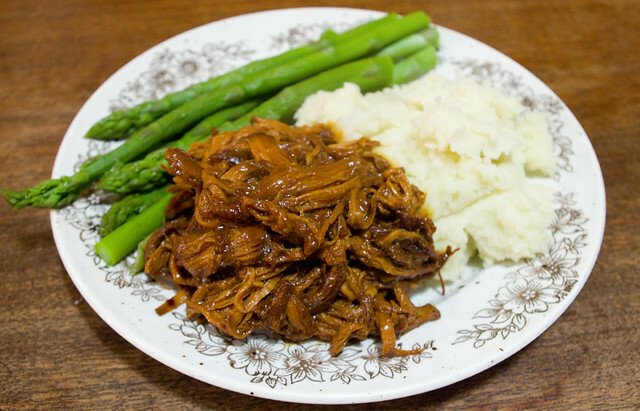 You can reheat frozen portions in the microwave, but the topping won’t get crispy. 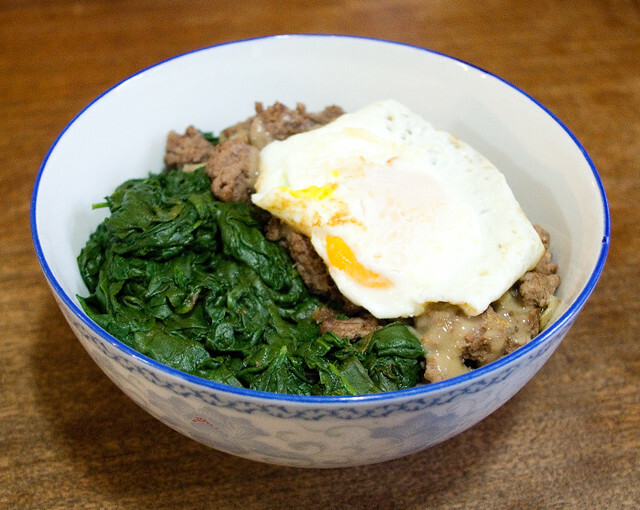 – This dish also travels and reheats well, so it’s perfect to bring to potluck meals. – Use a different kind of pasta. Most smaller pastas, such as penne, rotini, rigatoni, shells, or wagon wheels, work just as well as macaroni. Penne rigate is a favorite of mine and is probably used more often than macaroni in our household. Whatever you choose, you’ll need about two cups of dried pasta. 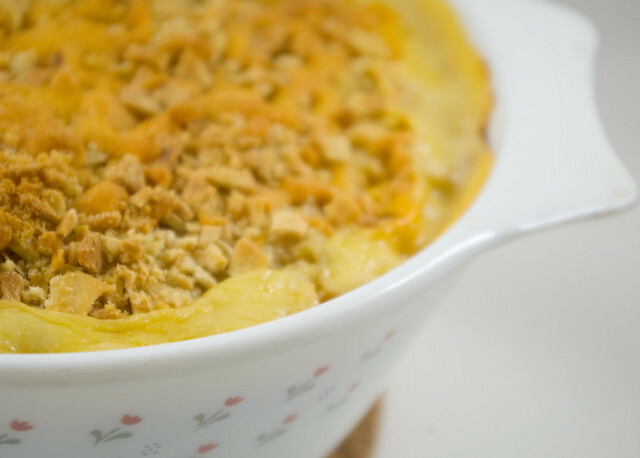 This dish, to me, is the only truly proper one for making Mom’s homemade macaroni and cheese (although in reality any appropriately-sized casserole dish works equally well). It’s just that this is what my mom used for the entirety of my childhood: a Pyrex casserole dish from the late 1970’s/early 1980’s with flowers on the side. – Use fresh pasta instead of dried. The yield for fresh pasta is different than dried, but in the end you’ll need about five cups of cooked pasta. – For a healthier dish, use whole-wheat pasta. 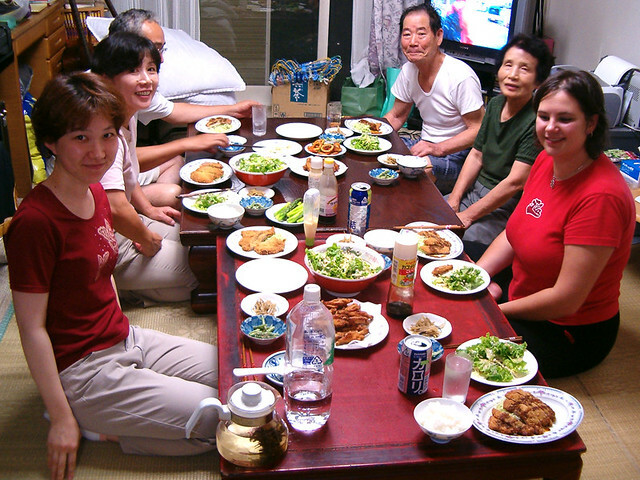 – If you’re cooking without a stove, prepare the sauce in a microwave and bake the final casserole in a toaster oven. You can even “bake” the casserole in the microwave, but the top won’t get crispy (as I learned the hard way when my oven broke when cooking dinner for my in-laws for the first time). – Change up the cheese; use a blend of cheddar and mozzarella/Gouda/etc., or switch up the cheese entirely. Sharp cheeses work best. – To make baby food for an older baby, use whole-wheat noodles that are made without eggs and whole-fat milk. Skip the onions and the crispy top. 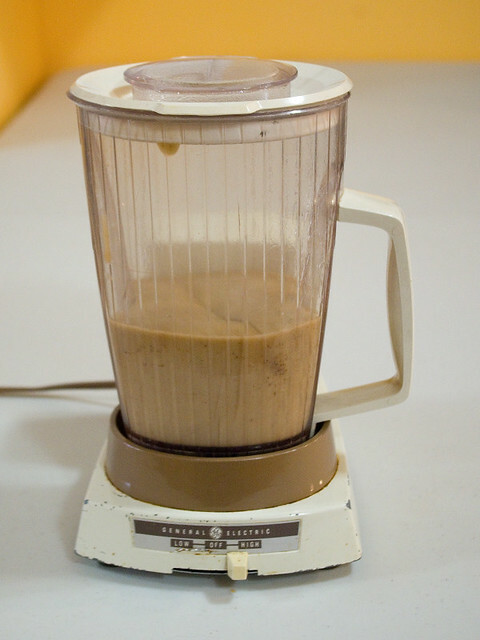 Run the macaroni and cheese through a blender/food mill/food processor to make it smooth, adding whole milk gradually until the desired consistency is reached. 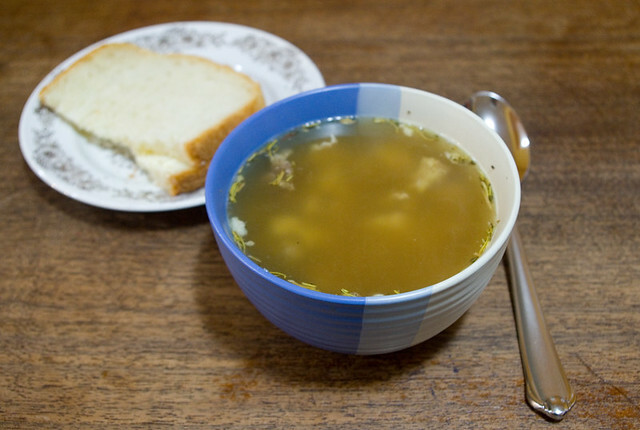 This works best while the mixture is still warm, as it does congeal when it cools. My daughters loved their macaroni and cheese baby food — and now they’re huge fans of the regular kind. I have a tendency to clip interesting recipes out of magazines, file them away in a recipe box, and then forget that they are there. Yet somehow recently when I thawed some homemade pumpkin puree for a pie that I didn’t end up making, I actually remembered that I had a recipe in my stash that might be useful. I thought I’d taken this recipe from an old Food & Drink, but a quick Google showed that it was actually from the October 2004 edition of Martha Stewart Living. 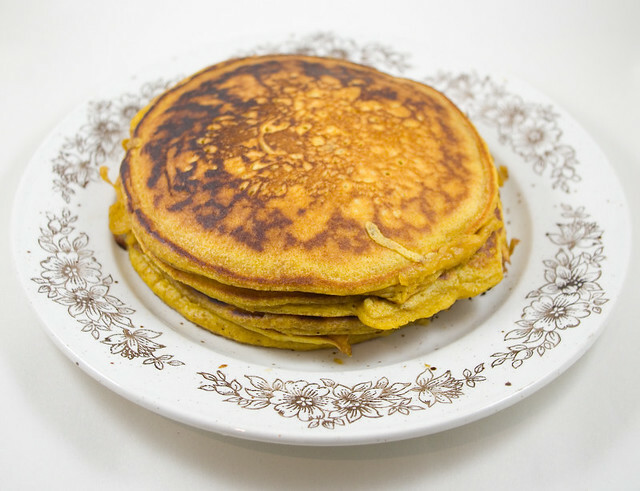 The recipe was for Pumpkin Pancakes, and although heaven knows it probably wasn’t also available online back when it was first published, it is there now. My pancakes weren’t Martha Stewart perfect, of course, but they did taste awfully good. They were light and fluffy and delicious, and the pumpkin and spice flavours were subtle enough that they went well with most sweet toppings. The pancakes were simple enough to make, with just a few additional ingredients added to a basic recipe. I’ll definitely be making this dish again — and perhaps with practice my pancakes will be a bit more symmetrical.